Bagworms, Webworms and Other Caterpillar Pests | Gardens Alive! Question. Help! A beautiful blue spruce in my front yard is being eaten by bagworms. We have been pulling the bags off as we find them, but every day there is another new crop. What can I do to get rid of these 'worms' and save my blue spruce? Mike: Two of the evergreens at my parents' house have bagworms high up. These trees are very tall (one is a good 70ft), so I can't remove the bags manually. I can rent an industrial sprayer that reaches 100ft, but I don't want to use chemicals. Is there anything non-toxic I can spray to get rid of them? Mike: …my Leyland Cyprus have it pretty bad, and a lot of the bags are too high to reach. Mike--Two of my arborvitae are absolutely writhing with bagworms. I've never seen them here before, but recognized them from an infestation I saw on junipers in Knoxville many summers ago. They have half-killed one huge tree already. What can I do? Mike: I have a honey locust tree infested with webworms. I have tried to control them with dormant oil spray in March and in the summer with Sevin. Unfortunately the little suckers return every year. Is there a systemic or organic treatment for this 'worm'? I don't want to spray the poor birds who are living in this tree, and I really want to stay away from those dreaded pesticides. Mike: The honey locust in our back yard is annually devastated by tiny caterpillars that enrobe themselves in a tent of silk and dead leaves. The tree is 25 feet high, so I can't reach it with an aerosol. We have tried to avoid using toxins to control pests, and I think the diameter of the tree is too small (about 7"") to pound or drill in the capsules I found in a garden store. Milky spore has controlled our Japanese beetles very well, but doesn't seem to have any effect on these bugs. any other pest caterpillar—including ones that DON'T make nests or attack trees. That solution is not milky spore, which only affects Japanese beetle grubs in the soil. Or dormant oil, which is great at smothering pests that spend their winter on tree bark, but no help against ones who spend the winter down in the soil or deep inside a protective nest. Or a highly toxic insecticide like Sevin (that's more of a threat to you and those poor birdies than to any pest.) Or systemic pesticide capsules pounded into the ground or trunk to poison the poor tree's sap (the use of which is hardly 'avoiding toxins', by the way…). The safe, sane—and highly effective—solution is to prune off any 'bags' and/or tent-like nests you can reach, and then spray the old original form of Bacillus thuringiensis on the rest of the tree while the caterpillars in question are actively eating (which is right now in most locales for bagworms and Fall webworms). Don't worry about that panic-inducing name—most people just call this organic pest killer by its initials: ""Bt"" , with a letter added at the end to indicate what strain or variety it is. 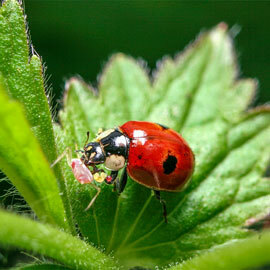 There are currently three different Bts, each affecting a different type of insect pest. The one that stops caterpillars—ALL caterpillars, by the way, not just ones that build little homes in your trees—is the kurstaki strain, ""BTK"". One of the oldest, most effective, and easiest to find tools in the organic arsenal (its been in use for close to 40 years), BTK is a naturally occurring soil bacteria that just happens to be deadly to caterpillars. It's available from Gardens Alive and other natural gardening product suppliers, and at most garden centers (retail brand names include Dipel, Green Step, and Thuricide; ingredient labels should say 'Bt' or BTK). Don't be surprised if a store keeper thinks it IS a chemical; BTK is used by lots of farmers to protect their sweet corn from tip-eating earworms, often without their knowing its one of those high-faluttin' organic things! And like we said earlier, Bt will work on ANY pest caterpillar that's actively feeding—cabbage lopers, tomato hornworms (what IS it with these 'worm' monikers for pest caterpillars? If I were an earthworm I'd sue! ), those nasty little ones that eat rose buds—ANY caterpillar; just spray it on the leaves they're eating and they will soon be daid. Back to the ones causing tree troubles: As AJ notes in his email, you can rent an industrial sprayer or use a pressure washer to get the Bt up into tall trees. Flush the sprayer several times first to make sure there aren't any soap or herbicide resides in there. And remember—you have to spray when your specific caterpillar is out and feeding. If you can't tell for sure, contact your local county extension office; they'll know when the pests are actively feasting in your locale. And finally, insect pests prefer weakened plants; you can greatly lessen the chance of infestation by treating your trees right. Don't use chemical fertilizers. Don't prune without being sure of what you're doing (pruning in the Fall, for instance, is ALWAYS wrong). Don't mulch with wood chips or shredded bark. Never pile any mulch up against the trunk, and never mulch more than an inch or two thick; those 'mounded' trees are doomed. In addition, always try and plant new trees and shrubs in the Fall or very early Spring; summer plantings have very little chance of ever being healthy. And no matter when you plant, keep young trees well watered until they are very well established.